On the night of 9-10 January in Kangasala we observed light pillars that were accompanied on both sides by steeply rising arcs. 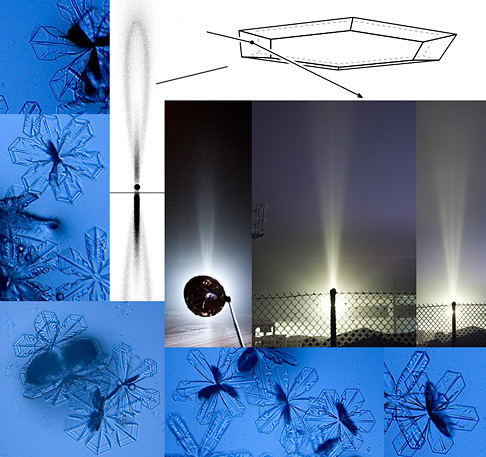 These arcs were seen both with floodlights (two rightmost halo photos in the collage above) as well as with narrow beam spotlight (the leftmost photo above). In floodlights the arcs were somewhat straight, while in the spotlight beam they tapered towards each other, perhaps forming a loop around the pillar. The display was visible for almost four hours in a very localized pocket of the Kangasala industrial area of 500 meters across at most. Atmospheric humidity was high, the area was surrounded by water fog. Probably emissions in the industrial area initiated nucleation of this fog to ice crystals. The temperature was -16 degrees Celsius. This halo probably arises from a simple reflection from nearly horizontal crystal faces. The crystals we used in the simulation (see above image; software used: HaloPoint 2.0 beta by Jukka Ruoskanen) are similar to those used in simulating elliptical halos and Bottlinger's rings. The raypath for the halo is same as for Bottlinger's rings, except that it occurs on the lower pyramidal face. The atmospheric conditions (temperature, high humidity) support the idea of such a crystals since Bottlinger's rings and elliptical halos are mostly observed in altocumulus virga, which form in similar conditions. Due to the halo forming raypath, this halo could be called as the super-Bottlinger if we were to adapt the naming system suggested by Walter Tape or the supra-Bottlinger in case Gunther Können’s naming system was used. The series of images captured in the spotlight beam show variation in the angle of these new arcs. Presumably this happened because the angles of the reflecting faces changed. It had been long suspected that elliptical halo sizes can change during the display - our observation provides now supporting evidence. However, we did not observe any elliptical halos. At times an elliptical glow was suspected around streetlights but these were never confirmed by photographs. Crystals were sampled and photographed at the same time as the display was photographed in the spotlight beam. The crystals have dendritic growth and it is difficult to see the structure responsible for the new halo. Possibly the tips of the branches are sloping. Such feature has been earlier pointed out by Walt Tape in a snow crystal photo. From the brightness variation between the pillar and the new halo in different stages of the display, we may assume that the extent of the sloping area in the crystal varies. Additionally, the display contained diffuse helic arc like extensions from the lamp, as seen in the middle photograph. These were also observed when only pillar was visible. Possibly the abundant crossed plates were behind their formation. See more photos from this night of halo hunting ( 1 - 2 ). Guys, this is absolutely fantastic! Congratulations to you! And Jukka's revolutionary simulator has stood the test again. I'm just sitting here staring at the photos and reading and re-reading the text... Stunning images and stunning discovery! Textbook example of discovering a new halo form together with it's origin. How many more will there be? Extremely impressive. Wow. Congratulations! And also a very beautiful and singular form. Awesome! That halo I don't know what it is but thats very new indeed. Today I got a CZA from snowflakes and my dad got video. Amazing indeed! Have you any estimations for the pyramid apex angle based on photographs? Is it even close to an angle which produces ellipses / bottlingers of the size that we've seen (well, we have seen ellipses with very various sizes, so probably the apex angle will suit at least one of them). Ellipses and this strange kind of a crystal are a puzzle. The simulation in the image above is just a quick version with pyramid apex angle of 165 degs. It is not quite enough if you compare to HID photo on the left. Somewhere around 170-175 would probably have been better and these values are also within the ones used for ellipses. Would be nice if someone could produce a divergent light simulation of this. We had an inkling of what we were looking at the time, but had we known better, we could have documented this more thoroughly. It would have been interesting to put the spotlight clearly below horizon (there were piles of earth in the area that would have allowed, say, -5 degs elevaton). According to Jari, in the hid photo the lamp is at about 0 degs elevation. There are significant variations in the width of the new halo in the HID series. I should do an animation that shows it. Clearly, the apex angle was changing. I have not done any thorough analysis on this yet, but my first impression is that the angle did not change in smooth continuity but, rather, it changed rather instantly and then stayed that way for a while. Yes, my estimation of the hid angle is 0 degs elevation. The camera was on a tripod and the HID lamp on a pile of snow. As Marko says, we should have tried negative elevation for the lamp but this did not occur to us amids all the chaos and exhilaration. Discrete changes intuitively sounds good, since crystallograpically a continuum of angles would be difficult to accept. Very good note. An animation would be illustrative! Oh, sorry guys, this is not a new halo. It is just a Bottlinger's ring and we are seeing here its parts above horizon. Bottliner is just another helic arc. Sure, Marko, if the explanation is correct. But a new, unseen component of a halo. That's a huge thing as well. The different opening angles of the loop gives good information about the apex angles that were needed (according to this hypothesis) to produce the halo. Perhaps we should collect the measurable ellipses and bottligers and see if there would be a set of discrete sizes after all. maybe something like this has been done in the past, but with new observations the measurements could be repeated and supplemented. Oh, sorry there is a mistake. Was supposed to say "...parts above lamp". It depends on the naming system and conventions. The raypath is 23 as opposed to 13 of Bottlinger. Although historically we have not separated the upper and lower sun pillars (2, 3-2-6, 2-1-2 vs 1, 3-1-6, 1-2-1) the raypaths are not the same. If I understand Tape's naming system, this is still a super-Bottlinger? Or maybe I'm just sleep deprivated. Jukka, read Sillanpää et al. There you see that there are different crystal angles in one display and in another other display yet another set of angles. You have fixed angles, but they are different at different times. Yes, Jari, there has been sometimes talk about whether upper and lower sun pillars should be treated as separate halos and similarly this applies to helic arc parts above and below light source. Maybe we observed then, after all, a new halo. Well, I would like to see Walt's and Können's thoughts. Yes, it strikes me as a contradiction to have a "pillar" but also a "subsun". Instead we should probably have subpillar (loads of tilt) and subsun (somewhat oriented plates). Now we have also learned about the supersun and should therefore have a superpillar? If we just have a "pillar" we should just have "sun" which makes no sense at all and tells nothing. I suppose upper and lower pillars have been called a pillar for the sake of convenience and the visual impression of a continuous halo. This is getting really interesting. If we call this super-Bottlinger, then we should also turn the helic arc into superhelic and subhelic arcs. The true subhelic arc would then turn into supersubhelic and subsubhelic arcs. Marko, yes the thing in Sillanpää et al is as you say, but I think we should accumulate more mass to see if eventually there is a limited set of angles. The number of angles might be large, but as the observation mass increases we might start seeing that the number of possible angles is a well defined set. This is of course stupid speculation without any crystallographic basis, but it is a starting point. Walt separates the sun pillar in supersun and subsun. But maybe the division is preserved only for halos that have reflection from a horizontal face. Helic arcs and Bottlinger's rings have no horizontal face reflection. For getting the mass data on the elliptical halo crystal angles we should get uniform diamond dust displays. Can't trust much the high cloud displays. Walt’s thoughts, you say? It is too soon to say much. But the photos are great, regardless of the explanation. The crystals look pretty distinctive, like plates with big sails attached. I can imagine that the sails might stabilize the orientations in such a way as to produce a corkscrew falling motion. Then you don’t need any crystallographic justification for the inclined faces---they are just the basal faces of the plates. You can sorta believe that similarly shaped crystals would assume similar corkscrew motions, with similar tilts. But it seems like all this is premature, until we have a decent idea of what a streetlight helic arc should look like. The same goes for the naming worries; it is too soon. I don’t suppose the crystals were still performing after the sun came up? That would have told a lot. Anyway, it must have been a fun night. Because we did not observe elliptical halos in the display, the old spiraling motion sounds like a nice candidate. The vertical sails would not make any halos, then? The conditions were exactly those where elliptical halos are observed: water fog and around -15 C. Actually, before we left for this night, I sent Jari email saying we could see elliptical halos. Somehow I would rather stick with elliptical halo crystal and explain their absence in some way. Near the lamp the swarm looked much like snow fall - there was not much crystal glitter. Maybe the elliptical halo simply got lost in it. We did not observe sublamps in this display although there was pillar. It was a display that shows up only from the distance. We left the scene when water fog took over, so we were not watching for sun halos, but it would probably have been foggy all day nevertheless. At least that's how it was in Tampere, 20 km away. Yes, the near vertical sails would make a halo, too, if the sails all had about the same inclination to the horizontal. The halo would be a perturbation of the parhelic circle, so you would not expect it to be impressive in a streetlight display. The near horizontal face halo (from the inclined basal faces), the near vertical face halo (from the sails), the ordinary Parry helic arc, the odd radius helic arc, and the parhelic circle itself are all special cases of the generalized helic arc, as you said, at least partly. You can get some intuition for the classical (i.e., source-at-infinity) version of these halos by intersecting a vertical cone with the celestial sphere. The vertex of the cone is at the sun, and the line elements in the cone are normal to the reflecting face of the crystal. So the slightly inclined basal faces would give you a very narrow cone, and the sails would give you an extremely wide, almost flat, cone. The parhelic circle itself arises from the truly flat, i.e., planar, cone. It is good this is illustrated in TapeMoilanen. Otherwise I would have been lost. Anyway, this makes these halos so simple. Congrats ! Really amazing...there's still much to discover. Here on 11th grazy fog, moisture up to 98%, very intense hoar frost, something that I have never seen. I used paintgun and kaoline that produced beautiful pillars and later went out on the field with the lamp but then the temperature started to rise and the diamond dust started to dissapear. The air was thick with water droplets and glints from ice crytals. Towards the lamp there was a pillar and opposite a nice fogbow with secondary supernumerarie. Congrats to you Krusel! What was the temp? Water fog conditions are the best halo conditions. In Rovaniemi the diamond dust that made the reflected Parry came from water fog. A month later the blue circle, diffuse subanthelic halo and other stuff formed in conditions that were on a water saturation treshold - there were occasional water fogs sweeping by. And now we had this Bottlinger in a middle of water fog. And moreover, odd radius display on snow surface seem to form when the surface has been sweeped by water fog. I made a quick geometry exercise to see what happens to the general helic arc in divergent light conditions. In this image there are two illustrations. One that resembles Marko's and Jari's photos is on the left. The apex angle of the pyramid face in this calculation was 170 degrees. On the right is a normal helic arc visualized as a surface (see Walt's streetlight paper to get a grip of the concept). The helic arc on the left has similar 3D-shape, but is pictured from the viewpoint of the camera in zy-plane (no perspective corrections). The leftmost image shows that in (omnidirectional) divergent light conditions the loop does not form a "solid" arc but rather an area of light - quite consistent with photos. The arcs rising from the lamp are more clear. The lamp is at 0 elevation. The shape of the halo is a result of purely geometrical examination and has no intensity information included. Thanks Jukka, excellent! I have two shots of what I think is the "normal" helic arc in a streetlight display: Image 1 (with superparhelia). Image2 (also with superparhelia). About 100 km to innerland around -20 to -25 with same conditions. Now I am starting to think that I should have drove. Unfortunately I had several technical problems with my car. Although it got fixed on the same day it kind of lost its reliability in my eyes for a while. Jukka, I think the spotlight situation in the left photo is more comparable with parallel light simulations while for the floodlight photos divergent light simulations would be needed. So your divergent light treatment should rather be resembling the two other photos. "In this image there are two illustrations. One that resembles Marko's and Jari's photos is on the left." My geometrical exercise is for divergent light and thus indeed has to be compared with the two rightmost photos in your compilation photo. As you can see, the arcs strecth out higher with no sign of a true loop; there is just light inside the would-be-loop, as the geometrical treatment predicts. Spotlight is very close to parallel light situation and therefore is more comparable with the parallel light simulation. Ah, bad reading Jukka. That's how it is with internet these days. Information is flowing too fast, either you write wrong, read wrong or see wrong. I also saw wrong. To me there was a loop in your simulation, but now that you explained it, I know better. One thing I think is worth pointing out is that the halo was readily visible with naked eye when the floodlights were far away. Say, a hundred to two hundred meters away. The spotlight in the photo was perhaps twenty to twenty five meters away and it was impossible to see any details of the halo, just the vee-shaped outline. It took a long series of photos in a stack to reveal the forked pillar structure with the spotlight. As Riikonen said, this was a display that was best seen from far away. Usually it is the other way around: the spotlight produces bright, shaprly defined halos but not in this case. In this image (be sure to examine it at full resolution of 900x600 pixels, use the four little icons in the upper right corner on the page) you can see the spotlight halo in good detail. Yes, so it is no wonder the elliptical halos were not seen. The 0 degs spotlight elevation is not favourable for ellipses. Had we been able to put the spotlight at, say 10 degs elevation, and far enough away, I bet the ellipse would have appeared around it. Next time we know better what to do when the "Trinity" (as Jari put it) appears. I added another photo that shows the floodlight halos all the way up. Here it is for what it's worth. Jari's last image is in good agreement with the calculations. And since the halo is contributed from all of those points of the 3D surface, the branches accumulate more light the more distance there is between light and observer. So your observation (better halo from further away) is in line with this reasoning. Just amazing how more new halos are popping up I wish I could move to a ski resort. Having talked with Jukka over the phone I now fully understand his geometrical treatment (the result that is, not the Mathlab part of it). We have the arcs in there and in between just diffuse light as the caustic curve is not overlapping with itself there (on the line of sight). So there is intensity information (the caustic curve and perspective), just not the Fresnel equations. I have made some simulations and seem to have best succes with an apex angle just shy of 170 degs. I need to compare the results with pictures more carefully though. And then the apex angle was apparently changing and I have yet to do the animation about it. Nice "triple pillar" you have here! I think that simulations is not matching with those photos. In simulations arcs seems to have clear intensity low near light source but photos are suggesting opposite e.g. arcs are brighter close to light. Did you shoot raw images or do you have some underexposed photos showing arcs better near the light to check this? Brihter arcs near light supports Walt's comment about pillars from inclinated crystal faces as explanation for these arcs. Probably those sails are fixing that angle. Some observations of Very broad sun pillar from not fixed (no sails) but limited inclinations are known. Few years ago I worked with all measured elliptical halo observations I could found. I tried to figure out if there are any fixed angles involved. Unfortunately I did not test my ideas well enough to make any final conclusions. However, I think it is possible that there is set of fixed angles. Problem to identify these angles seems to arise from the fact that radii of ellipse is changing as function of sun elevation. Also horizontal diameter changes since minimum deviation can occur only at high sun elevations when ellipses are very faint. Ellipses are so called non-contact halos. All this makes size of ellipses vary a lot even if we have fixed angles. It also seems that there is two different orientations as well. Horizontal orientation is causing sun centered ellipses and inclined orientation is causing downward elongated ellipses. Even that is not fully sure if ellipses are simple refraction halos or does ray path include any reflections. Some photos suggest colors which means refraction. At least one polarization observation suggests that reflection is also involved. More polarization observations of ellipses would be nice. Well, if both Walt and Jarmo think it is gyration, then I guess there is no choice but to jump into their camp. You are right, I could not make a simulation where the Bottlinger would be brightest on the sides. It is brightest on the top, no matter what. Even with spotlight there is some divergent effect, so that must be taken into account. The 22 tanget arc for example stretches towards the lamp in the spotlight beam. I think Lars's simulator does not have the possibility for exotic crystals. Gedzelman I think made a simulation program that simulates gyration and pendulum motion, we should try that. Anybody still has it? I think this is safe to call this Bottlinger in any case. We don't know if Frank Bottlinger's observation was from pyramid angle or from gyrating crystals (the latter which he suggested as an explanation). Well, I must go through all those crystal photos and make a gallery of them. and maybe I find it on more images in halo database. Yes, that's just superparhelia. And the three parallel pillars are formed by three bulbs & reflectors on the lightpole. Is there also Moilanen arc, the diffuse long V-shape? No, it's the divergent light 3D UTA that records as such a diffuse glow there. We got to see some super strong 3D halos during that mini-expedition. Jarmo, do recall, that the spotlight is not a parallel light situation even though it resembles it much more than a wide beam streetlight. Therefore the top of the loop is somewhere between a parallel light simulation and the 3D surface (from omnidirectional light) case in the leftmost spotlight photo. The streetlight version shows no sign of the loop closing in, as is suggested by the 3D surface. In spotlight case there is a loop, but perhaps its poor definition compared to simulation is due to the fact that the light creating the phenomenon consists of non-parallel rays, even though they are not as deviated as in streetlight beam. Jukka. Yes, you are right about difference between parallel and divergent light halos. However, in this case there is nothing else difference between explanations than available surface area in crystals which cause the reflection we need. With that crystal drawings above those slopes are small. Also it seems that suitable surfaces in crystal sample seems to be quite small in general (Ok, we can not be sure about that). Small surfaces should give us fainter sides of the halo than top. This is true with spotlight too, because with nearby halos fysical size of lit surface area does matter. well, it is possible that those slopes are large enough, but why the pillar is not clearly brighter then? It should be if we have more horizontal surface area. Or I have not figure out true shape of those snow stars at all. We need some better simulations to be more sure about this. These 3D halos are hard to imagine. If Jarmo says 3D halos are hard to imagine, then I might as well stop trying. Anyway, I added a link (number 2) to my photos at end of the post above, go and see, there are plenty of crystal photos. They are in two scales, 33% shrinked from the original or full size (cropped, of course). Hopefully those photos help with the brainstorming. We should also explain the helic arc like halo that is seen in some of the photos. Close to the lamp Bottlinger disappeared but this helic arc did not waver. And tomorrow night the video will be ready (knock on wood...). The change in the appearance (width) of the halo is so sudden that whatever the explanation regarding the wedge / orientation will be, the change will have to happen fast. The change is also seen at least in one stage in the pair of floodlight photos. I was about to stack some photos but then noticed the change. Just like that elliptical halo I got back in 2008 as the ice crystal layer moved the halo would expand and shrink and it did this several times. If I could find a way to make a movie the images I would do it but I don't know how. Michael, there is a very simple freeware called photolapse. You may try it. Michael, you can download PhotoLapse from several places on the net. For example here. I have now posted a video and two additional heavily contrast enhanced phorographs in this new post. Jarmo, one of those new images shows the bottom of the halo better. The spotlight images already show what there is to be seen, the rest is behind the blocker.